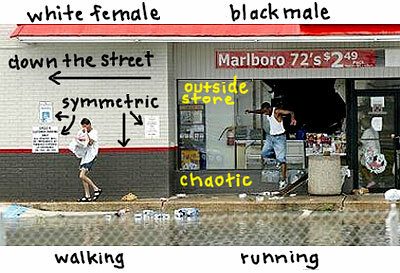 Following on my post yesterday, and piggybacking on today's exceptional visual analysis by Wonkette (Finding vs. Looting -- link; Loot, Find, Rinse, Repeat -- link), I'm still thinking about the racial bias in the Katrina coverage. On Tuesday, it was my hope that Katrina might actually help raise consciousness and consideration of the neglected topics of poverty and racism. By today, however, I was having my doubts. Without dwelling on the examples Wonkette covered so aptly, I have to wonder if it isn't time for the news wires and/or news websites to rethink how captions are created and used. As a long standing tradition, photojournalists have been tasked with supplying captions which the photo agencies simply pass on to media outlets. In this new electronic era, however, the practice is not only outdated, in many instances (like this one) it can be inappropriate, grossly reductive, even slanderous. Specifically, you cannot have an outlet like Yahoo News presenting photos referring to a situation as "looting" when the referenced image carries more nuance than that. Further, generic captions that make reference to looting (among a series of other events)-- when assigned to dozens and dozens of photos that are completely unrelated to that activity -- also come across as irresponsible. Looters hit a drug store in the French Quarter district of New Orleans in New Orleans, Louisiana, following Hurricane Katrina. Fresh floods, fires and looting rode in the destructive wake of Hurricane Katrina, deepening a humanitarian crisis that left hundreds feared dead and sections of New Orleans submerged to the rooftops. Beyond the poor grammar, how do you justify using a word like "hit?" 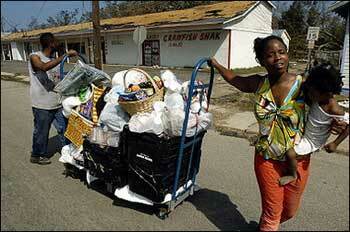 Also, how do we know these people aren't just taking necessities? Finally, how much does the caption color the content? For example, does it cause us to assume this woman is smiling (like she's getting away with something), as opposed to grimacing? And, when -- especially in the MSM -- do get to have that conversation about the ethics of survival? Finally, I had to include this last shot. Because it came up in my YahooNews search for "Katrina" and "looting," my immediate assumption was that this couple had just helped themselves to "The Crayfish Shak." Again, the context can't help but effect the assessment of facial gestures (the man looking back toward the restaurant; the women with a seemingly unassuming air). And the strange or simply rediculous thing is that they seem to have free reign to write such ignorant and manipulative crap. Any news service who writes such captions should be taken to court or simply exposed publicly, much in the way you've done it here. 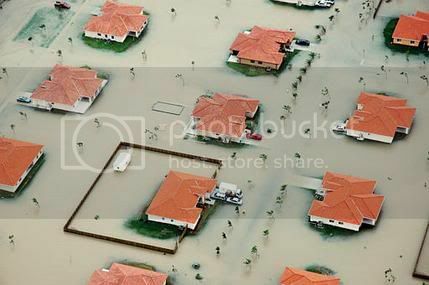 "In this Aug. 26, 2005 file photo provided by the Miami Dade-Fire Rescue Dept., homes in South Dade County (Fla.) are seen submerged in rising water caused by Hurricane Katrina. The loss of life and property caused by Hurricane Katrina is expected to exceed the wrath of record-setting Hurricane Andrew, which struck in 1992. (AP Photo/Miami Dade-Fire Rescue, Lt. Eric Baum, File )"
The water hasn't even reached the floors of the houses. I find the image interesting, looked at quickly. If you look, there are two black umbrellas and I wonder if the woman is carrying both. I think, when I zoom, that there is someone smaller directly behind her, following very close, as if in a dangerous situation, perhaps her child or friend. Some people noted that the signs say "NOW OPEN", and that her goods were bagged. Do we have anything other than the caption that says she is a looter? Do I really live in a country with such stupid reporters?? In addition to the sign saying "Open Now" the doors are open, not breached, and the woman's goods are bagged, and she doesn't even look like a thief. Some folks on another site commented on the darkness within, indicating that the store was being looted, but there is no electricity in the city to run such niceties as lights. The final image looks like the owners have packed what they could rescue and are regretfully looking back. 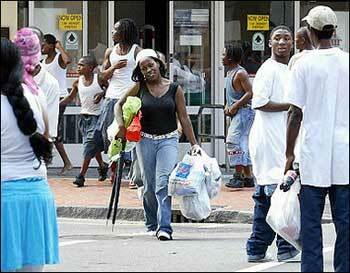 How many looters bring along their toddlers? Right now, I don't care if folks are looting... the attention of any authorities ought to be focussed upon getting as many people out of that filthy water and then the bodies dredged up... to minimize what could be a massive outbreak of disease (such as cholera) which will make the dehydration even more deadly. Shelves can be restocked... after the streets are repaired and the water is drained and the power running again. If I owned a shop there, I'd figure that survivers were free to take the pampers and toothbrushes and bottled beverages, and just write off the store and its contents. The problem is that there is no authority. 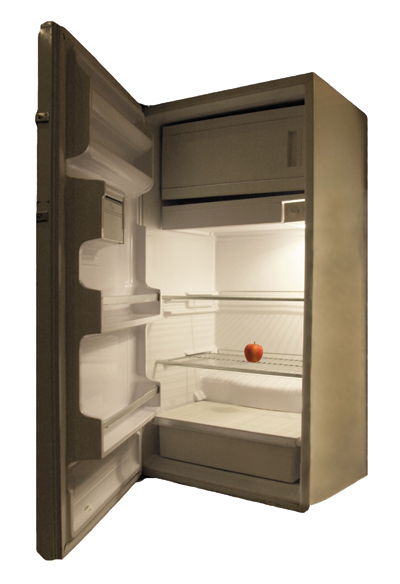 Too many agencies running around witless and not enough preparedness, despite ample warning. Homeland security? Other nations have offered aid: rescue teams, medical supplies, water purification and field hospital setups... and our good administration has turned down those offers as "not needed". We can do it ourselves. Right. Then how come New Orleans is sinking into anarchy? How come geniuses such as Hastert are advocating not rebuilding the city, but totally abandoning it? There are no words except unprintable ones to describe how I feel about the federal reaction to a federal disaster. Something else also struck me when looking at the news coverage here in Europe: most of the times when the caption read something along the lines of "seeking shelter/being rescued/needing food", the image depicted black people. When the caption ran "lost everything/helping somebody else", the people on the photo were white.. The deeper implication one can read into this would be that black people "cannot care for themselves and are poor", whereas whites are "rich (though they have lost a lot) and are still helping in the face of theur own desaster". I hesitate to think that this is deliberate, but I also don't think that this just reflects the true statistics of how wealth and the need for shelter relates to color of skin.